University students in Catalonia went on strike on Wednesday to demand the reduction of tuition fees, thus further heating up a week already marked by the stoppage of medical staff in public healthcare centres. Students at the Autonomous University of Barcelona (UAB) blocked the main accesses to the campus with barricades, while the Pompeu Fabra University (UPF) cancelled courses in two faculties that had been occupied the night before. Students are demanding a 30% reduction in tuition fees. Whilst the measure was approved by MPs in the Catalan parliament in 2016, it has not yet been implemented. Healthcare workers resumed a week-long strike on Wednesday, after negotiators failed to reach a compromise over the reduction of workload. Doctors took to the streets for the third day in a row. The rally made it to the gates of the Catalan Parliament, where they were joined by firefighters also protesting. Some demonstrators reportedly tried to break into the building. Doctors’ unions and the administration are slowly finding common ground, but reaching an agreement is proving difficult. While medical workers want a maximum of 28 daily visits in order to spend at least 12 minutes with each patient, the Catalonia’s Health Institute (ICS) rejects setting any limits. 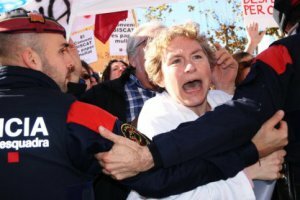 With around 5,700 doctors working in public health centres called upon to join the protest, the Metges de Catalunya union said participation in the strike was 76% on Tuesday, while the Catalan government estimates that 44.23% of public health professionals joined the action. Public workers from different sectors are also protesting this week to demand more resources. University professors will demonstrate on Thursday against ‘precarious’ working conditions, while school and high school teachers will protest on the same day to urge the Catalan government to revert the cutbacks carried out during the financial crisis. Firefighters are taking to the streets on Wednesday and Thursday from 12 to 2 pm to demand better working conditions and material.